Glen Canyon National Recreation Area (shortened to Glen Canyon NRA or GCNRA) is a recreation and conservation unit of the National Park Service (USA) that encompasses the area around Lake Powell and lower Cataract Canyon in Utah and Arizona, covering 1,254,429 acres (5,076 km2) of mostly desert. The recreation area borders Capitol Reef National Park and Canyonlands National Park on the north, Grand Staircase-Escalante National Monument on the west, Vermilion Cliffs National Monument and the northeasternmost reaches of Grand Canyon National Park on the southwest, and the Navajo Nation on the southeast. The Glen Canyon NRA was established in 1972 "to provide for public use and enjoyment and to preserve the area's scientific, historic, and scenic features." The stated purpose of Glen Canyon NRA is for recreation as well as preservation (whereas a national park may carry more emphasis on natural preservation). As such, the area has been developed for access to Lake Powell via 5 marinas, 4 camping grounds, two small airports, and houseboat rental concessions. The southwestern end of Glen Canyon NRA in Arizona can be accessed via U.S. Route 89 and State Route 98. State Route 95 and State Route 276 lead to the northeastern end of the recreation area in Utah. The current Lake Powell lies above Glen Canyon, which was flooded by the Glen Canyon Dam, completed in 1966. Lake Powell has nearly 2,000 miles (3,200 km) of fish-holding shoreline and provides opportunity to fish for largemouth bass, smallmouth bass and striped bass that swim in the midst of the recreation area. Several local marinas provide houseboats, powerboats, jet skis, kayaks, fishing gear, and related equipment to visitors. The Permian through Jurassic stratigraphy of the Colorado Plateau area of southeastern Utah that makes up much of the famous prominent rock formations in protected areas such as Capitol Reef National Park and Canyonlands National Park. 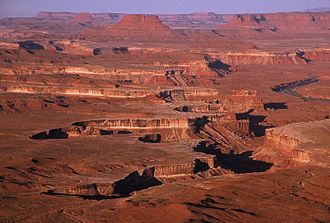 From top to bottom: Rounded tan domes of the Navajo Sandstone, layered red Kayenta Formation, cliff-forming, vertically-jointed, red Wingate Sandstone, slope-forming, purplish Chinle Formation, layered, lighter-red Moenkopi Formation, and white, layered Cutler Formation sandstone. Picture from Glen Canyon National Recreation Area, Utah. The geology of the area is dominated by the Glen Canyon Group, consisting of the Navajo Sandstone, Kayenta Formation, and Wingate Sandstone. The entire stratigraphic section included rocks dating from the Cretaceous to Pennsylvanian. With over one million visitors per year, it is inevitable that some will deface the rock faces of the canyon. The Glen Canyon NRA has implemented a voluntourism program wherein volunteers sign up for a five-day houseboat trip to remove graffiti from the canyon walls. ^ "Listing of acreage as of December 31, 2011". Land Resource Division, National Park Service. Retrieved 2012-12-14. ^ "NPS Annual Recreation Visits Report". National Park Service. Retrieved 2012-12-14. ^ "Summary of Geologic History". Archived from the original on 2009-12-26. Retrieved 2010-05-20. ^ "Stratigraphic Columns" (PDF). 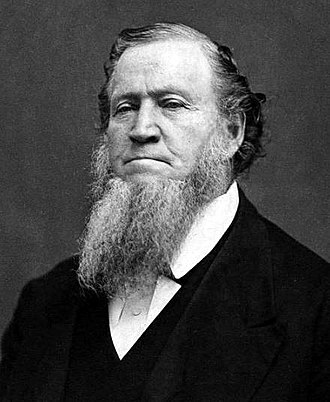 Nps.gov. Archived from the original (PDF) on 2017-02-09. Retrieved 2016-07-18. ^ "Graffiti Removal and Intervention Team". Glen Canyon NRA. National Park Service. Retrieved 2018-05-03. Wikimedia Commons has media related to Glen Canyon National Recreation Area. Wikivoyage has a travel guide for Glen Canyon National Recreation Area. Official National Park Service Concessionaire Site Lake Powell Resorts & Marinas, managed by ARAMARK, is an authorized concessioner of the National Park Service, Glen Canyon National Recreation Area. The Chinle is controversially considered to be synonymous to the Dockum Group of eastern Colorado and New Mexico, western Texas, the Oklahoma panhandle, and southwestern Kansas. The Chinle is sometimes named as a formation within the Dockum Group in New Mexico. The Chinle Formation is part of the Colorado Plateau and Range, a probable separate depositional basin within the Chinle is found in northwestern Colorado and northeastern Utah. The southern portion of the Chinle reaches a thickness of a little over 520 m. Typically, the Chinle rests unconformably on the Moenkopi Formation, there is no designated type locality for this formation. United States Geological Survey economic geologist Raymond C, robeck in 1956 revised the unnamed members of Gregory by identifying and naming the Temple Mountain member as the basal-most unit in the area of the San Rafael Swell of Utah. In 1957 John H. Stewart revised the Shinarump Conglomerate of G. K. Gilbert,1875, and Edwin E. Howell,1875, and Gregory,1917, and renamed it the Shinarump member of the Chinle formation. An overview of the geology of the area was created by USGS geologist Forrest G. Poole, sikich revised the unit and assigned more members assigned in 1965. The areal extent of the unit was mapped by Wilson and Stewart in 1967, in 1972 the areal limits were modified and an overview created by Stewart and others. Kelley assigned more members and revised the unit in 1972, Lucas and Hayden did the same thing in 1989. The Rock Point Member was assigned by Dubiel in 1989, the Chinle was raised to group status by Lucas in 1993, thus raising many of the members to formation status. He included the formations of the Dockum Group of eastern New Mexico and this modified nomenclature is controversial, many still retain the Chinle as a formation and separate out the Dockum Group. The Dockum was named in 1890, before the Chinle, if Lucas is correct, his Chinle Group should be named the Dockum Group due to stratigraphic nomenclature rules. Overviews of the Chinle were created by Dubiel and others and Hintze, the formation members and their thicknesses are highly variable across the Chinle. 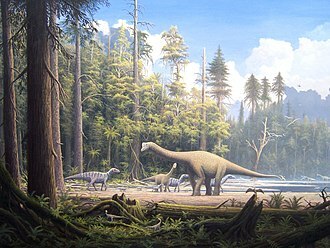 The Cretaceous is a geologic period and system that spans 79 million years from the end of the Jurassic Period 145 million years ago to the beginning of the Paleogene Period 66 Mya. It is the last period of the Mesozoic Era, the Cretaceous Period is usually abbreviated K, for its German translation Kreide. 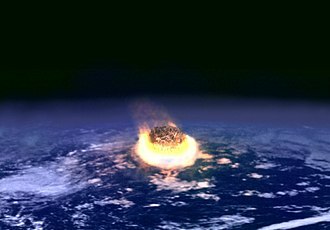 The Cretaceous was a period with a warm climate, resulting in high eustatic sea levels that created numerous shallow inland seas. 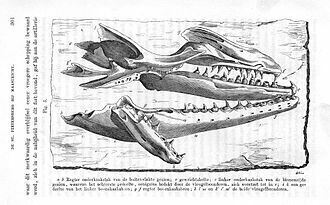 These oceans and seas were populated with now-extinct marine reptiles and rudists, during this time, new groups of mammals and birds, as well as flowering plants, appeared. 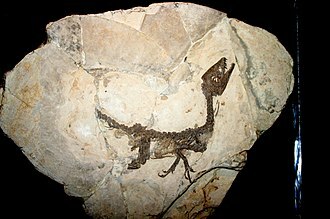 The Cretaceous ended with a mass extinction, the Cretaceous–Paleogene extinction event, in which many groups, including non-avian dinosaurs, pterosaurs. The end of the Cretaceous is defined by the abrupt Cretaceous–Paleogene boundary, the name Cretaceous was derived from Latin creta, meaning chalk. The Cretaceous is divided into Early and Late Cretaceous epochs, or Lower and Upper Cretaceous series, in older literature the Cretaceous is sometimes divided into three series, Neocomian and Senonian. A subdivision in eleven stages, all originating from European stratigraphy, is now used worldwide, in many parts of the world, alternative local subdivisions are still in use. As with other geologic periods, the rock beds of the Cretaceous are well identified. No great extinction or burst of diversity separates the Cretaceous from the Jurassic and this layer has been dated at 66.043 Ma. A140 Ma age for the Jurassic-Cretaceous boundary instead of the usually accepted 145 Ma was proposed in 2014 based on a study of Vaca Muerta Formation in Neuquén Basin. Víctor Ramos, one of the authors of the study proposing the 140 Ma boundary age sees the study as a first step toward formally changing the age in the International Union of Geological Sciences, due to the high sea level there was extensive space for such sedimentation. Because of the young age and great thickness of the system. Chalk is a type characteristic for the Cretaceous. It consists of coccoliths, microscopically small calcite skeletons of coccolithophores, the group is found in England, northern France, the low countries, northern Germany, Denmark and in the subsurface of the southern part of the North Sea. Glen Canyon is a natural canyon in the Vermilion Cliffs area of southeastern and south-central Utah and north-central Arizona in the United States. Like the Grand Canyon to the south, Glen Canyon is part of the system of canyons carved by the Colorado River. In 1963, a reservoir, Lake Powell, was created by the construction of the Glen Canyon Dam, flooding much of Glen Canyon beneath water hundreds of feet in depth. Lake Powell was the result of negotiations over the damming of the Green River within Dinosaur National Monument. The dam remains an issue for modern environmentalist movements. Beginning in the late 1990s, the Sierra Club and other organizations renewed the call to dismantle the dam, Glen Canyon and Lake Powell are managed by the U. S. Department of the Interior within Glen Canyon National Recreation Area. 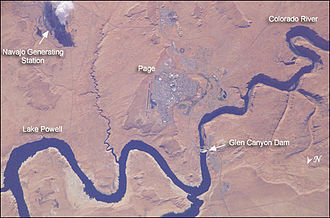 Between 1958 and 1960, four investigative phases, combined with other surveys prior to 1957, the Lower Glen Canyon survey was completed in 1958. Excavations began during the summer of 1958 on 16 sites, open sites are the majority on both sides of the river. The majority of sites, mostly Navajo camps, feature lithic garbage or ceramics, most of the cultural remains found are chipped stone tools, including projectile points, drills, knives and ground stone tools and manos. The collection of sherds are mostly Tusayan Gray Ware and Tusayan White Ware, petroglyph panels are found throughout Glen Canyon. “Pecked and incised figures depict mountain sheep, human figures, human handprints, geometric figures range from circles and spirals to highly complex rectilinear patterns. The human figures have triangular bodies, painted figures have been reported for both sides of the river. Petroglyph panels of such quality are lacking from the regions adjacent to Glen Canyon”. Studies indicate a chronology for the Lower Glen Canyon prehistory, “from pre-A. D.1 to the 15th century, a Late Basketmaker II Era is represented by several sites. Radiocarbon dates from charcoal material are from A. D.250 to 440. Basketmaker III is not found in the Lower Glen Canyon, but is documented in Navajo Canyon, Basketmaker III introduces fired pottery, mostly Lino Black-on-gray and Lino Gray, and some small amounts of Lino Fugitive Red and Obelisk Gray. 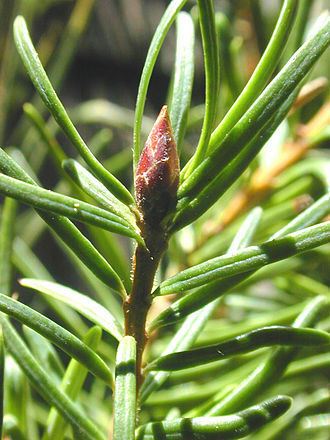 A national park is a park in use for conservation purposes. 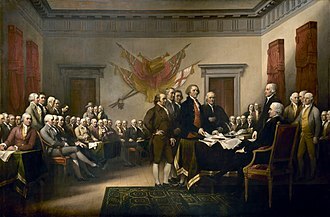 Often it is a reserve of natural, semi-natural, or developed land that a sovereign state declares or owns, although individual nations designate their own national parks differently, there is a common idea, the conservation of wild nature for posterity and as a symbol of national pride. 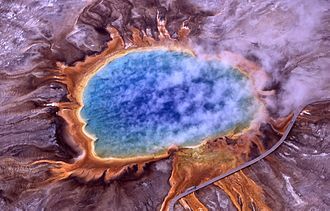 An international organization, the International Union for Conservation of Nature, although Yellowstone was not officially termed a national park in its establishing law, it was always termed such in practice and is widely held to be the first and oldest national park in the world. The first area to use national park in its legislation was the USs Mackinac Island. Australias Royal National Park, established in 1879, was the third official national park. In 1895 ownership of Mackinac Island was transferred to the State of Michigan as a state park, as a result, Australias Royal National Park is by some considerations the second oldest national park now in existence. The largest national park in the meeting the IUCN definition is the Northeast Greenland National Park. According to the IUCN,6,555 national parks worldwide met its criteria in 2006, IUCN is still discussing the parameters of defining a national park. National parks are almost always open to visitors, in 1971, these criteria were further expanded upon leading to more clear and defined benchmarks to evaluate a national park. In 1810, the English poet William Wordsworth described the Lake District as a sort of property, in which every man has a right and interest who has an eye to perceive. 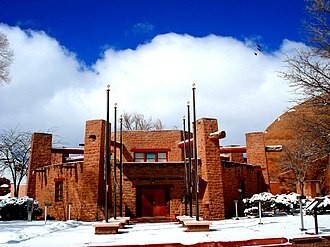 It was known as Hot Springs Reservation, but no authority was established. Federal control of the area was not clearly established until 1877, John Muir is today referred to as the Father of the National Parks due to his work in Yosemite. He published two articles in The Century Magazine, which formed the base for the subsequent legislation. President Abraham Lincoln signed an Act of Congress on July 1,1864, ceding the Yosemite Valley, according to this bill, private ownership of the land in this area was no longer possible. A houseboat is a boat that has been designed or modified to be used primarily as a home. Some houseboats are not motorized, because they are moored, kept stationary at a fixed point. However, many are capable of operation under their own power, float house is a Canadian and American term for a house on a float, a rough house may be called a shanty boat. In Western countries, houseboats tend to be owned privately or rented out to holiday-goers. Examples of this include, but are not limited to, London, in Zimbabwe, specifically on Lake Kariba, houseboats have been in use since the creation of the lake in the late 1950s/early 1960s. A houseboat makes it easy to experience the Zambezi basin and all the wildlife, as a lot of game come down to the water for drinking. There is a houseboat and fishing community on the side of Hong Kong Island known as Aberdeen floating village. There was one such community in the Yau Ma Tei Typhoon Shelter, in India, houseboats as accommodation for tourists are common on the backwaters of Kerala, see below, and on the Dal Lake near Srinagar in Jammu and Kashmir. Houseboats in Kerala, south India, are huge, slow-moving barges used for leisure trips and they are a reworked model of Kettuvallams, which, in earlier times, were used to carry rice and spices from Kuttanad to the Kochi port. Kerala houseboats were considered a convenient means of transportation, the popularity of Kettuvallams has returned in the function as major tourist attractions. Such a houseboat is about 60 to 70 feet long and about 15 feet wide at the middle, the hull is made of wooden planks that are held together by ropes of coconut fiber, the usual wood is Anjali. The roof is made of poles and palm leaves. The exterior of the boat is painted with coats of cashew nut oil. Unlike their counterparts in Kerala, the houseboats in Srinagar, Jammu & Kashmir are usually stationary and they are usually moored at the edges of the Dal Lake and Nageen lakes. Some of the houseboats there were built in the early 1900s and these houseboats are made of wood and usually have intricately carved wood paneling. 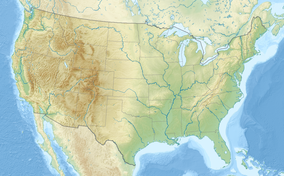 San Juan County is a county located in the southeastern portion of the U. S. state of Utah. As of the 2010 census, the population was 14,746 and its county seat is Monticello, while its most populous city is Blanding. The county was named by the Utah State Legislature for the San Juan River, San Juan County borders Arizona and New Mexico at the Four Corners. 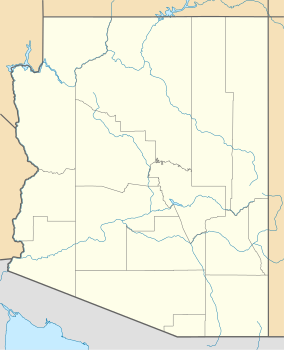 San Juan County was organized in 1880, according to the U. S. Census Bureau, the county has a total area of 7,933 square miles, of which 7,820 square miles is land and 113 square miles is water. 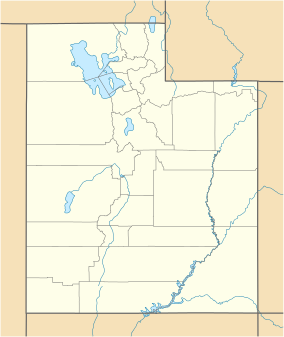 It is the largest county by area in Utah, the countys western and southern boundaries lie deep within gorges carved by the Colorado and San Juan Rivers. 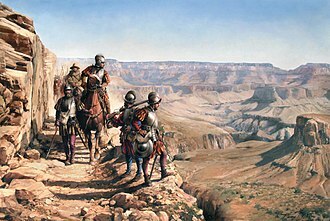 Tributary canyons, cutting through layers of the surrounding deserts, have carved the land up with chasms, cliffs. 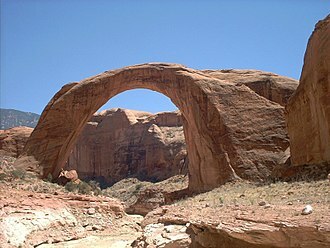 In the center of the county are Cedar Mesa, Comb Wash, Natural Bridges, canyonlands National Park is primarily within the county borders. The Eastern side of Glen Canyon National Recreation Area / Lake Powell in in San Juan County, rising above all, the Blue Mountains reach to nearly 12,000 feet and the La Sal Mountains rise to 13,000 feet. Both ranges are covered with lush forests vividly contrasting with the scenery below, the elevation change within the county is from near 13,000 feet in the La Sal Mountains to 3,000 feet at Lake Powell, an elevation change of 10,000 feet. The county is cut by deep and spectacular canyons, red rock and mountain meadows and evergreen forest. The towns run primarily on an axis along U. S. Route 191. The only operating Uranium Processing plant in the United States operates in the town of Blanding, San Juan County is home to numerous oil and gas fields that produce primarily from the Desert Creek and Ismay Formations. San Juan County is bordered by more counties than any county in the United States. 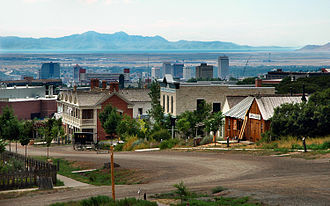 San Juan County in Utah and New Mexico are two of twenty-two counties or parishes in the United States with the name to border each other across state lines. The racial and ethnic composition of the population was 50. 4% Native American,45. 8% white,0. 3% Asian,0. 2% African American and 2. 3% reporting two or more races. 4. Glen Canyon Dam is a concrete arch-gravity dam on the Colorado River in northern Arizona, United States, near the town of Page. The 710-foot high dam was built by the U. S. Bureau of Reclamation from 1956 to 1966 and forms Lake Powell, a dam in Glen Canyon was studied as early as 1924, but these plans were initially dropped in favor of a dam in Black Canyon. After a long fight, the USBR agreed not to build the dam in Dinosaur, since first filling to capacity in 1980, Lake Powell water levels have fluctuated greatly depending on water demand and annual runoff. Operation of Glen Canyon Dam helps ensure a distribution of water between the states of the Upper Colorado River Basin and the Lower Basin. During years of drought, Glen Canyon guarantees a water delivery to the Lower Basin states, in wet years, it captures extra runoff for future use. The dam is a source of hydroelectricity, averaging over 4 billion kilowatt hours per year. Water managers and utilities state that the dam is a source of renewable energy. Annual discharge from the Colorado River and its tributaries ranges from 4 to 22 million acre feet and the rivers enormous silt or sediment load, created problems for settlements in the Lower Colorado River Valley and navigation on the lower portion of the river. 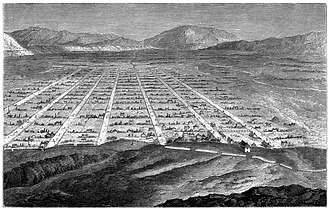 During droughts, there was too little water available for irrigation, in 1904, the Colorado River was accidentally redirected after it damaged a canal gate in Mexico, causing the river to flood part of Californias Imperial Valley and create the Salton Sea. After this catastrophe and Arizona began to call for a dam to control the tempestuous river, in 1922, six U. S. states signed the Colorado River Compact to officially allocate the flow of the Colorado River and its tributaries. The third lower basin state, did not ratify the Compact until 1944 because it was concerned that California might seek to appropriate a portion of its share before it could be put to use. The total,16.5 million acre feet, was based on thirty years of streamflow records starting in the late 1890s. The Grand Staircase-Escalante National Monument is a U. S. National Monument protecting 1,880,461 acres of land in southern Utah. President Bill Clinton designated the area as a monument in 1996 using his authority under the Antiquities Act. Grand Staircase-Escalante encompasses the largest land area of all U. S. National Monuments, the Monument is managed by the Bureau of Land Management rather than the National Park Service. This was the first National Monument managed by the BLM, visitor centers are located in Cannonville, Big Water and Kanab. The Monument stretches from the towns of Big Water and Kanab, Utah on the southwest, to the towns of Escalante, encompassing 1.9 million acres, the Monument is slightly larger in area than the state of Delaware. The western part of the Monument is dominated by the Paunsaugunt Plateau and the Paria River and this section shows the geologic progression of the Grand Staircase. Features include the slot canyons of Bull Valley Gorge, Willis Creek, the center section is dominated by a single long ridge, called Kaiparowits Plateau from the west, and called Fifty-Mile Mountain when viewed from the east. Fifty-Mile Mountain stretches southeast from the town of Escalante to the Colorado River in Glen Canyon, the eastern face of the mountain is a steep,2200 foot escarpment. The western side is a slope descending to the south. East of Fifty-Mile Mountain are the Canyons of the Escalante, the Monument is bounded by Glen Canyon National Recreation Area on the east and south. The popular hiking and canyoneering areas include the slot canyons of Peekaboo and Brimstone Canyons, the Devils Garden is located in this area. Access is via the Hole-in-the-Rock Road which extends southeast from the town of Escalante, the road was constructed to facilitate Mormon settlement of southeastern Utah, including the town of Bluff. The road is used by ranchers to access the flat desert at the base of Fifty Mile Mountain for grazing cattle. Since 2000, numerous fossils over 75 million years old have been found at Grand Staircase-Escalante. In 2002, a volunteer at the Monument discovered a 75-million-year-old dinosaur near the Arizona border, on October 3,2007, the dinosaurs name, Gryposaurus monumentensis was announced in the Zoological Journal of the Linnean Society. G.
State Route 95 or Bicentennial Highway is a state highway located in the southeast of the U. S. state of Utah. The highway is a road for tourism in Lake Powell and does not serve any cities. Although the highway has existed since the 1930s as a dirt road. The highway forms part of the Trail of the Ancients National Scenic Byway and it runs 121 miles west from the junction of U. S. Route 191, to the junction of SR-24 in the town of Hanksville. It passes through the community of Fry Canyon. Frys Canyon contains the gas station between Hanksville and Blanding. A seasonal gas station is operation at the Hite Marina area during the summer months, sR-95 was added to the state highway system in 1935 as a spur connecting SR-47 near Blanding with Natural Bridges National Monument. It was extended in 1949, crossing the Colorado River at Hite, except for a short piece near Blanding, the road remained unpaved through the 1960s. The first major realignment was approved in 1962 and completed in 1966, bypassing the old crossing at Hite, the highway was improved and paved in time for the U. S.
Lake Powell is a reservoir on the Colorado River, straddling the border between Utah and Arizona. It is a vacation spot that around two million people visit every year. It is the second largest man-made reservoir by water capacity in the United States behind Lake Mead. Lake Powell was created by the flooding of Glen Canyon by the Glen Canyon Dam, which led to the creation of Glen Canyon National Recreation Area. The reservoir is named for explorer John Wesley Powell, a one-armed American Civil War veteran who explored the river via three wooden boats in 1869, in 1972, Glen Canyon National Recreation Area was established. It is public land managed by the National Park Service, and it lies in parts of Garfield and San Juan counties in southern Utah, and Coconino County in northern Arizona. The northern limits of the lake extend at least as far as the Hite Crossing Bridge, a map centered at the confluence of the Escalante River 37°17′22″N 110°52′20″W with the Colorado River gives a good view of the extent of the lake. Lake Powell is a storage facility for the Upper Basin states of the Colorado River Compact. The Compact specifies that the Upper Basin states are to provide an annual flow of 7,500,000 acre feet to the Lower Basin states. In the 1940s and early 1950s, the U. S. Bureau of Reclamation planned to construct a series of Colorado River dams in the rugged Colorado Plateau province of Colorado and Arizona. Glen Canyon Dam was born of a controversial damsite the Bureau selected in Echo Park, by agreeing to a relocated damsite near Lees Ferry between Glen and Grand Canyons, Brower did not realize what he had gambled away. At the time, Brower had not actually been to Glen Canyon, when he saw Glen Canyon on a river trip, Brower discovered that it had the kind of scenic and wilderness qualities often associated with Americas national parks. Over 80 side canyons in the colorful Navajo Sandstone contained clear streams, abundant wildlife, natural bridges, by then, however, it was too late to stop the Bureau and its commissioner Floyd Dominy from building Glen Canyon Dam. San Juan County includes the Utah section of the Four Corners Monument. Great blue herons at Tonys Tank (near Mormon Lake), Coconino National Forest. San Francisco Peaks in background. 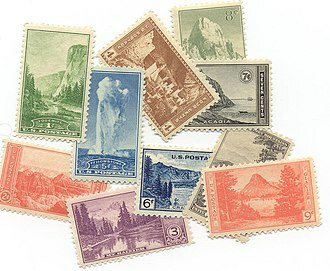 In 1934, a series of ten postage stamps were issued to commemorate the reorganization and expansion of the National Park Service. Customs House at the Salem Maritime National Historic Site in Salem, Massachusetts. 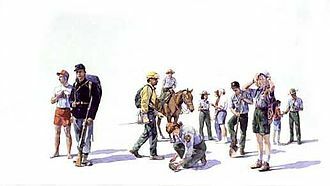 Depicts twelve figures, most in NPS uniforms, shown in occupations from left to right: a lifeguard, a Civil War reenactor, fire management, mounted patrol, researcher and/or natural resources with fish, a female ranger with two visitors, a laborer, a climber/rescuer, and a youth with a male ranger. Bogd Khan Uul National Park, Mongolia. One of the earliest preserved areas now called a national park. Manuel Antonio National Park in Costa Rica was listed by Forbes as one of the world's 12 most beautiful national parks. Grand Prismatic Spring in Yellowstone National Park, Wyoming, United States; Yellowstone was the first national park in the world. Houseboat Cornelia in Ystad / Sweden 2018. Panorama of Glen Canyon Dam showing Lake Powell, Glen Canyon Dam and Carl Hayden Visitor Center. A boater on the river in Glen Canyon before damming, circa 1898. A prominent cuesta of Navajo Sandstone rims the edge of the San Rafael Swell in eastern Utah. The Permian through Jurassic stratigraphy of the Colorado Plateau area of southeastern Utah that makes up much of the famous prominent rock formations in protected areas such as Capitol Reef National Park and Canyonlands National Park. From top to bottom: Rounded tan domes of the Navajo Sandstone, layered red Kayenta Formation, cliff-forming, vertically jointed, red Wingate Sandstone, slope-forming, purplish Chinle Formation, layered, lighter-red Moenkopi Formation, and white, layered Cutler Formation sandstone. Picture from Glen Canyon National Recreation Area, Utah. The Golden Throne, a rock formation in Capitol Reef National Park. Though the park is famous for white domes of the Navajo Sandstone, this dome's color is a result of a lingering section of yellow Carmel Formation carbonate, which has stained the underlying rock. North Rim of the Grand Canyon National Park, Arizona. Erosional features within Glen Canyon National Recreation Area. Kayenta Formation, Capitol Reef National Park, Utah. Parting lineation, from lower left to upper right; Kayenta Formation, Canyonlands National Park. Moenkopi Wash in Coconino County, Arizona (1914). View north of Hanksville from Route 24. Factory Butte in background. Hoodoo within the Chinle Formation, west of Moab, Utah, along the Chicken Corners off-road trail. Ridge in background is part of the Wingate Sandstone. Chinle Badlands, Grand Staircase-Escalante National Monument, Utah, US.